Watch News Time Bangla TV Channel Live at YuppTV. 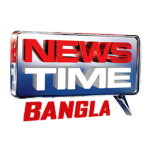 News Time Bangla is a 24-hour bengali news channel. Watch News Time Bangla TV Channel Live with High Quality Only at YUPPTV.COM.